because like a flower of the grass he will pass away. V. 11: How does a flower of the grass "pass away?" How long does it take a little flower to die? V. 11: In what ways can a rich man "fade away" in the midst of his pursuits? 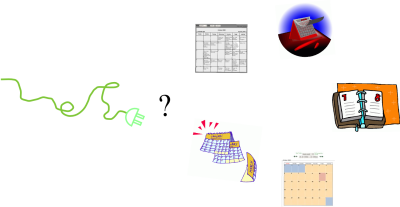 I integrate Google Calendars into my clients' websites because Google Calendars are free, allow group sharing & editing, integrate multiple calendars into one, and are very easy to syndicate. Let me explain by way of an example. I have a lot of calendar events to keep track of--my wife and my schedules, anniversaries & birthdays for family & friends, events at church, at my business, clients' calendars, and as a pastor, various community calendars scattered throughout multiple websites and printed publications. I really don't want to compare multiple calendars with each other every time I add an event to my own personal calendar. So I've grouped all the events I can control in separate calendar files under one Google Calendar user account. 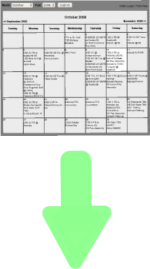 I open my Google Calendar and all my different events display in one unified view. My wife and I share some calendar files so we can both edit them, even simultaneously from different locations. But the events I can't control still live in websites & newsletters where I have to manually enter them into my calendar if I can find the time. 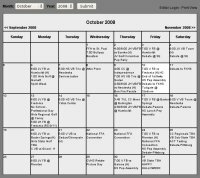 What's more, if I install a calendar for my clients that can't easily be syndicated via RSS and thereby integrated into another calendar, too often the client simply doesn't use the calendar. Disconnected calendars are an evil; even a result of the Fall and probably of Babel. But there is a solution. Normally I'm not real excited about retyping someone else's calendar events. But in one case I did type them in: I want to go to my local high school's sports events to get to know people in the community, so I added all the high school's sports events to my calendar, in its own calendar file. Google makes it easy to put that calendar into any web page by inserting a little code Google provides, which results in a calendar like the one below. Works great! So now I know what's going down at the football stadium. And what's cool is all my friends can add these events to their own calendar by clicking the "+ Google Calendar" button at the bottom. But I don't want to add the high school's events to this calendar every time the high school's own calendar changes. Nor do I want to be promoted to the "Calendar editor" position at the high school. They already pay someone to do that. and for people who visit the calendar to add it to their own personal calendar. V. 5: When you lack wisdom in a trial: What words do you say? What kinds of harm may result? Why do you lack wisdom? How can you get wisdom? V. 5: What does it mean to give "generously?" To give "without reproach?" Vv. 6-8: What does it mean to "ask in faith, with no doubting?" What does each result & evidence of doubting mean, and what counterpart does it find in faith? What should you do when you next face a trial? Note: You may download all study guides in one PDF file here. I am the LORD...no other gods before me . So the 1st Commandment’s requirement is based on the reality of God’s covenant with us, and in His having already redeemed us. That is why we must keep His commandments! The covenant formula reads literally in Hebrew: “I will be to you for a God, and you will be to me for a people.” Cf. with the KJV’s similar literal rendering. Is. 45:21-22: 21 And there is no other god besides me, a righteous God and a Savior; there is none besides me. 22 Turn to me and be saved, all the ends of the earth! For I am God, and there is no other. Matt. 4:10: Then Jesus said to him, "Be gone, Satan! For it is written, ' You shall worship the Lord your God and him only shall you serve.'" Deut. 32:17: They sacrificed to demons that were no gods, to gods they had never known, to new gods that had come recently, whom your fathers had never dreaded. 2 Chron. 32:19: And they spoke of the God of Jerusalem as they spoke of the gods of the peoples of the earth, which are the work of men's hands. Ps. 96:3-5: 3 Declare his glory among the nations, his marvelous works among all the peoples! 4 For great is the LORD, and greatly to be praised; he is to be feared above all gods. 5 For all the gods of the peoples are worthless idols, but the LORD made the heavens. Rom. 1:22-23, 25: 22 Claiming to be wise, they became fools, 23 and exchanged the glory of the immortal God for images resembling mortal man and birds and animals and reptiles. 25 ...they exchanged the truth about God for a lie and worshiped and served the creature rather than the Creator, who is blessed forever! Amen. Ps. 44:20-21: 20 If we had forgotten the name of our God or spread out our hands to a foreign god, 21 would not God discover this? For he knows the secrets of the heart. Deut. 32:16 : They stirred him to jealousy with strange gods; with abominations they provoked him to anger. WSC 46: The first commandment requireth us to know and acknowledge God to be the only true God, and our God; and to worship and glorify him accordingly. WSC 47: The first commandment forbiddeth the denying, or not worshiping and glorifying the true God as God, and our God; and the giving of that worship and glory to any other, which is due to him alone. Matt. 5:48: Be perfect, as your heavenly Father is perfect. And walking humbly with him. And ascribing the praise of any good we either are, have, or can do, to fortune, idols, ourselves, or any other creature. In the end, to keep this commandment is to keep the whole law, and to break this commandment is to break the whole law! Excursus on the death penalties – Which ones apply today? In the Noahic covenant God limited human courts to meting out no greater punishment than that which fits the crime. God made this covenant with all mankind, so this limitation applies to all human courts. Gen. 9:5-6: 5 And for your lifeblood I will require a reckoning: from every beast I will require it and from man. From his fellow man I will require a reckoning for the life of man. 6 Whoever sheds the blood of man, by man shall his blood be shed, for God made man in his own image. The Noahic limitation on human courts is expressed in the “an eye for an eye, tooth for a tooth” principle called the Lex Talionis, the “law of the tooth.” Its limitation was not rescinded by the Mosaic death penalties, and was applicable to citizens of other nations. The punishment must still fit the crime. Ex. 21:23-25: 23 But if there is harm, then you shall pay life for life, 24 eye for eye, tooth for tooth, hand for hand, foot for foot, 25 burn for burn, wound for wound, stripe for stripe. Lev. 24:16-22: 16 Whoever blasphemes the name of the LORD shall surely be put to death. All the congregation shall stone him. The sojourner as well as the native, when he blasphemes the Name, shall be put to death. 17 Whoever takes a human life shall surely be put to death. 18 Whoever takes an animal’s life shall make it good, life for life. 19 If anyone injures his neighbor, as he has done it shall be done to him, 20 fracture for fracture, eye for eye, tooth for tooth; whatever injury he has given a person shall be given to him. 21 Whoever kills an animal shall make it good, and whoever kills a person shall be put to death. 22 You shall have the same rule for the sojourner and for the native, for I am the LORD your God. The sin is against God when someone worships other gods, and the offense committed against God is worthy of death. Yet in the Mosaic covenant, the sin’s investigation & punishment were delegated to a human court, which remains under the Lex Talionis’ limitation. Deut. 17:4-6: 4 and it is told you and you hear of it, then you shall inquire diligently, and if it is true and certain that such an abomination has been done in Israel, 5 then you shall bring out to your gates that man or woman who has done this evil thing, and you shall stone that man or woman to death with stones. 6 On the evidence of two witnesses or of three witnesses the one who is to die shall be put to death; a person shall not be put to death on the evidence of one witness. Deut. 17:7: 7 The hand of the witnesses shall be first against him to put him to death, and afterward the hand of all the people. So you shall purge the evil from your midst. The Lex Talionis limitation still applies in the NT. Personal retaliation is forbidden; only the civil courts may execute the death penalty. But the NT does not give human courts the right to execute the death penalty for offenses against God; rather, it reserves that punishment to be executed by the hand of God alone. Rom. 12:19 : Beloved, never avenge yourselves, but leave it to the wrath of God, for it is written, "Vengeance is mine, I will repay, says the Lord." Hebrews 10:26-31: 26 For if we go on sinning deliberately after receiving the knowledge of the truth, there no longer remains a sacrifice for sins, 27 but a fearful expectation of judgment, and a fury of fire that will consume the adversaries. 28 Anyone who has set aside the law of Moses dies without mercy on the evidence of two or three witnesses. 29 How much worse punishment, do you think, will be deserved by the one who has spurned the Son of God, and has profaned the blood of the covenant by which he was sanctified, and has outraged the Spirit of grace? 30 For we know him who said, “Vengeance is mine; I will repay.” And again, “The Lord will judge his people.” 31 It is a fearful thing to fall into the hands of the living God. Matt. 5:38-41: 38 You have heard that it was said, ‘An eye for an eye and a tooth for a tooth.’ 39 But I say to you, Do not resist the one who is evil. But if anyone slaps you on the right cheek, turn to him the other also. 40 And if anyone would sue you and take your tunic, let him have your cloak as well. 41 And if anyone forces you to go one mile, go with him two miles. The pedagogical purpose of the death penalties—to teach how heinous sins against God are—has been accomplished by their OT practice and now consummated in the death of Christ, rendering their practice no longer necessary. The death penalty for murder is still required, because human courts must execute punishments that fit the extent of the crime’s offense against one’s fellow man. The death penalties for committing an offense against God are no longer required, because God reserves the right to execute those punishments Himself. What are some ways you often respond to trials? Are trials a reason for joy? Why? Why not? Notice James says "when you fall into trials." Why does James say "Count it" all joy in v. 2? Consider Phil. 3:8. What does it mean to "Count it all joy?" Consider Gen. 50:20; Rom. 8:28. What results do trials bring about? Trials produce the t___________________________, which produces s_______________, which makes you p_______________________________. How does each thing produce the next thing? What is God's goal in your trials, according to v. 4?